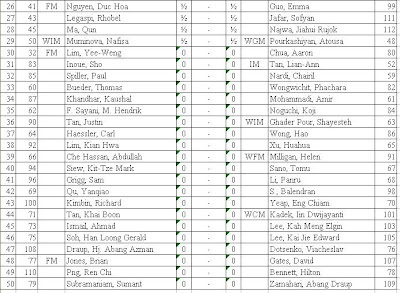 (15) NM Ronnie Lim (FIDE 2281) (3/6) won againts IM Irwanto Sadikin (FIDE 2429) (3/6) Syabas! It's very interesting matchup between two teenage Grandmasters on the first board in the seventh round between GM Nguyen Ngoc Truong Son (white) of Vietnam and GM Negi Parimarjan (black) of India after both won their respective opponents in the sixth round. Both are among the current leaders with 5 points beside Yu Yangyi from China. Whereas the defending champion, GM Li Chao will play againts Indonesian International Master, Tirto, on board 6 after a draw with Rostum Tolentino. While Uzbek GM, Marat Dzhumaev, will play white againts Yu Yangi of China on the second board. On the third board, it will be a battle between Iran (GM Ehsan) and Germany (GM Schebler). Let's see how the results going to be towards the final three rounds. Would it be the Vietnamese chess prodigy or the Indian chess wizard that will march forward to be the champion? Or they just draw and Yu Yangi takes over as the leader? How about GM Li Chao, the defending champion? Can he catch up? Maghi Belajor Dialek Perak Yeop! Setelah "jenuh" browsing dan surfing laman-laman blog catur tempatan, "teman" login sebentar ke facebook. Bukan selalu "bebeno" "teman" bukak facebook sebab sibuk dengan "mende-mende" lain dan tugasan-tugasan kerja. "Teman" lebih banyak spend masa ber"blogging" iaitu kemaskini blog dan visit local chess blogs terutamanya sekarang ini yang sedang berlansung DAT Malaysia Open dan AmBank Challenge di Hotel Cititel, Mid Valley. Berikan maksud ayat ini: "Anak sape le yg meghebeh kat tgh2 padang nih?!!" Berikan maksud ayat nih: "Teman nak gi nangkap brochat dalam dua tiga ekor"
Begitu ler serba sedikit tentang dialek Perak dan dialek Kampar. What an encounter GiLoCatur had on Monday afternoon at around quarter to 4.00pm. Yes, GiLoCatur met with one of Indian young chess talents and prodigies, GM Negi Parimarjan in person. Just yesterday, GiLoCatur wrote an entry about him. SO UNBELIEVABLE! Even GiLoCatur had a chance to have a short and spontaneous interview with him together with Hairulov and his Nusa Mahkota teammate, Aziz. 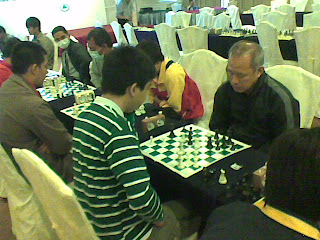 GiLoCatur (right) with GM Negi Parimarjan from India. The wonderful moment GiLoCatur recorded with a picture with him. Surely, meeting a chess wonder kid like him who holds the record of being the second youngest ever to be granted a GM title before he was 14 years old is a great moment for a chess lover and fan like GiLoCatur. 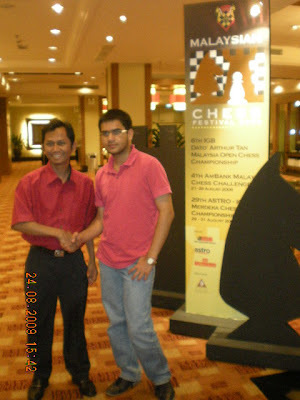 A renown Malaysian chess blogger, Mr Hairulov of http://hairulovchessmaniacs.blogspot.com/, interviewing GM Negi Parimarjan who is participating in the 6th edition of Dato' Arthur Tan Malaysia Open held in Cititel Hotel. GiLoCatur : Which game do you prefer? rapid or classical? GiLoCatur : How many Grandmasters India currently has? Aziz : When did you start playing chess? GM Negi : When I was about 4 years old. Hairulov : Who is your chess idol? Hairulov : Do you know Mas Hafizul? GM Negi : Yes. I played him twice before. I lost one then I drew one. Actually, GiLoCatur, from an observation, was amazed with the fact that GM Negi has a very sharp memory (isn't this very important to a chess player?). And also he seems well prepared with questions like that. He could remember well how many times he has played with his opponent, in this case our own IM Mas. Even he knows well his opponent as he is very aware of the International Master (IM) title Mas Hafizul holds (Doesn't this tell that he makes well preparation for his game and opponent). He also knows how many GMs his country has. In fact, the answer of 19 is surely correct. India has as July 2009, 19 Grandmasters. 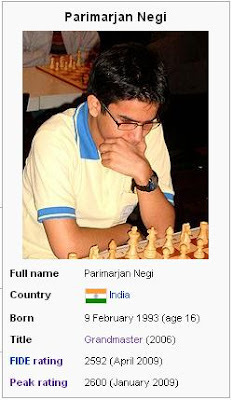 Do you know who is India's first Grandmaster? The answer is non other than the world champ himself, Viswanathan Anand. And how many Woman Grandmasters does India have? The answer is 11 and 17 WIMs are attempting to become one. (Mr Google has led GiLoCatur to this indianchess.blogspot link). GiLoCatur believes if we ask our young chess players how many IMs, FMs, or WIMs our country has, many might not give the correct answer. Aziz also took the opportunity to have a picture with the future world champion ... who knows! Best of luck! from GiLoCatur to GM Negi Parimarjan in the tournament and hope to enjoy his visit in Malaysia. Getting into round 5 on Tuesday morning at 9.00am, GM Negi is currently ranked 15th after four rounds with 3 points after winning the first two rounds and drew both the third and fourth rounds. He will play black on the sixth board againts WIM Zhang Xiaowen, the 25th seed in round 5. Terima kasih or Thank you for spending your valuable time having pictures and short interview with us. On Board 1, Malaysian junior Izz Saifuddin will play white againts the only perfect scorer of 4 points player from Philippine, Lim Samson Jr. His countryman, Panopio Rodolfo Jr, will play white againts his opponent, Cheah Cheok Fung. While both local players, Jax Tham and Ilhamuddin, will play on the third board. 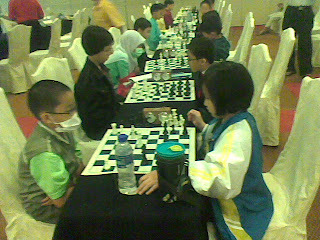 DAT Malaysia Open 2009 is very proud to have several young chess talents and prodigies. 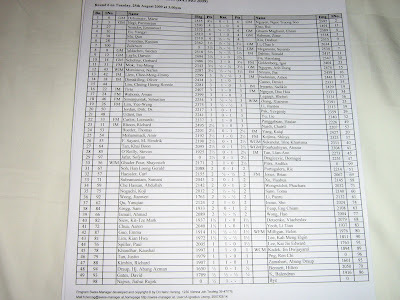 The top three of them in the starting list are the most notable and what GiLoCatur means. GM Li Chao (China), GM Nguyen Ngoc Truoc Son (Vietnam) and GM Negi Parimarjan (India) have created history in the world of chess. It would be incredible if GM Wesley So of Phillipines could also participate in the tournament. They are among the top world chess juniors and teenagers. 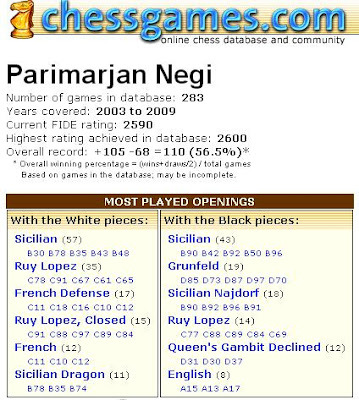 The above is some statistics about his opening repertoire from chessgames.com. It looks like that his favorite one is Sicillian. He became the second youngest GM ever after Sergey Karjakin in July 2006 after earning the third and final GM norm at Chelyabinsk Region Superfinal Championship. However GM Negi once was defeated by our own IM Mas (visit the report here as reported by Hairulov) in the 9th round of the Parsvnath Commonwealth Chess Championship 2007 held at India. Our young chess players should make this feat as a motivation that they can be strong chess masters too and become Grandmasters provided that they work hard to achieve the dream. Eventhough many of our young players do not have the opprtunity and chance to have a strong Grandmaster as their trainer and coach as GM Negi has GM Nigel Short as one of his trainers and coaches. Hard work and strong will with current advanced technology and IT surely will help them to achieve the dream. 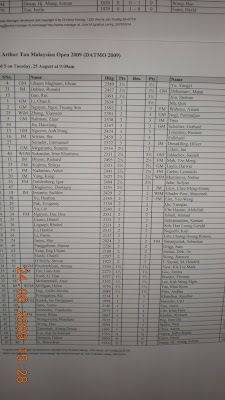 As GiLoCatur glanced down the first round result from http://datmo.net/2009/08/round-1-results/, few results that really excite me especially of our junior chess players who are participating in the DAT Malaysia Open 2009. 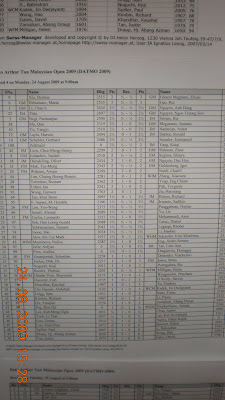 The first one is the win by Wong Jianwen againts higher-rated Singaporean IM. The second one is that Yeoh Li Tian managed to draw with a Vietnamese FM. Syabas to both of them. Come back for further report. 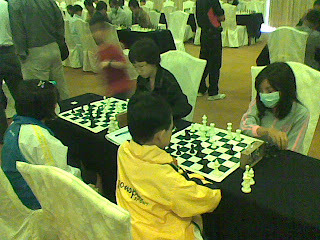 14-year-old Wong Jianwen played black on board 43 and won against IM Tan Lian-Ann from Singapore. The 52-year-old chess master is four times Singaporean Olympiad team member and six times Singapore champion. Hopefully such victory will provide Jianwen's confidence to perform well in the DAT Malaysia open and meeting Malaysian senior players. Malaysian chess prodigy, Yeoh Li Tian, starts his DAT Malaysia Open journey with a good result when he managed to draw with FM Nguyen Duc Hoa from Vietnam who FIDE rating is 2300+ in the first round. In second round tomorrow morning, Jianwen will play white against IM Ashot Nadanian on board 15, while Li Tian will play black againts Yu Yangyi on board 20. BEST OF LUCK to both of them and all other Malaysian players! GiLoCatur has joined several Malaysian chess bloggers in covering the on-going 6th Dato' Arthur Tan Malaysia Open being held in Mid Valley. Please visit the link at http://malaysianopen.blogspot.com/. A Tribute to Datuk Tan Chin Nam! Below article regarding about one of the important chess figures in Malaysia, Datuk Tan Chin Nam, should be shared and known by local chess enthusiasts and lovers. Datuk Tan Chin Nam is regarded as the driving force behind chess in the country. IT’S been nine months since I last met Datuk Tan Chin Nam in Penang. That Sunday in November, he was still basking in the glory of winning the 2008 Melbourne Cup in Australia. It was an unprecedented and historical win for him: the only horse owner ever to win that coveted cup four times. Prior to the Malaysia Chess Festival starting tomorrow, I sat down with him again and this time, it was at his office at Menara Tan&Tan in Kuala Lumpur. This time, instead of horses, he turned his attention to the other interest in his life, which is chess. This game of kings has taken up much of his free time, effort, and money since 1974. In that year, he was elected president of the Malaysian Chess Federation. But despite stepping down in 1986, he could never get chess out of his life. He remains the main engine behind chess in this country. It is estimated that in the past 35 years, he has poured at least RM10mil into the game. Then, as he leaned forward as if to confide in me, Tan boomed: “But you know what? It’s not all about money. I did it because of personal joy. I enjoy chess just like I enjoy horse racing. But I’ve already achieved the peak in horses. Grand plans: ‘I am embarking on the Malaysia chess project to take the Malaysian chess culture to a higher plane,’ says Datuk Tan Chin Nam. How does he see the direction of chess in Malaysia in the next five to 10 years? “I am very certain the progress will be phenomenal. To achieve this, I am embarking on the Malaysia chess project to take the Malaysian chess culture to a higher plane,” he said. “Various Asean governments already support chess to a great degree, including Vietnam, Singapore, the Philippines and Indonesia. Malaysia is the one exception that can do better. So my proposal is that the Government can help chess the same way that it already supports other sports. 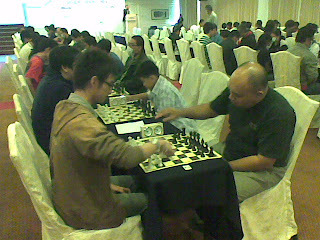 For example, let foreign professional chess players into Malaysia to raise our standard to the full international level. “Our neighbours give strong foreign players permanent residencies or even citizenship. Singapore has about 10 of them. In Vietnam, even more. For instance, China’s grandmaster Zhang Zhong is a permanent resident in Singapore and plays for Singapore. “In Malaysia, we don’t even have a grandmaster. If we get a competent core of grandmasters here, I believe the effort will be self-sustaining. You have the grandmasters teaching younger players (how about hiring a strong GM like Nigel Short to teach Malaysian young prospects??) and once they reach that level, it doesn’t go back down. For example, England achieved it in the 1960s, same with Indonesia, India and China. Self-sustaining, so that it continues on its own. 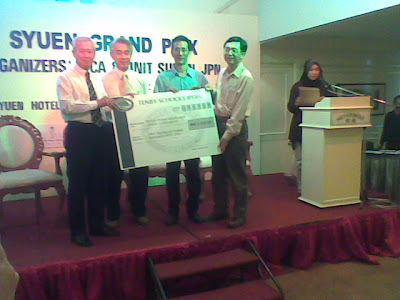 “The Malaysia chess project also involves organising high-level tournaments. We already have some success putting Malaysia on the international chess map. 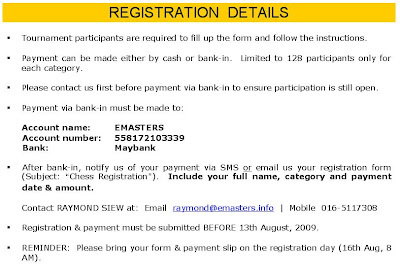 Saturday is the start of the sixth Malaysia Chess Festival. I’m committed to the next five years of the Arthur Tan Malaysia open, which is the festival’s centrepiece. But all these plans would require money and a lot of fund-raising, I remind him. “Right now, my Tan Chin Nam Foundation awards scholarships to needy university students. I’m asking my people to see how a separate fund can be set up and properly administered within the foundation specifically for chess development. I asked about the chess centre that was set up on the fourth floor of the Wilayah Complex in Kuala Lumpur in February this year. This centre, as well as the Malaysia open, was dedicated to Arthur Tan, his son who passed away in Australia in 2004. Arthur grew up in a chess-playing family, competing against siblings and relatives, and playing across the board and over the Internet. People who knew him said he could talk business 24 hours a day, reminding them of his father. He had a similar business management style. In Malaysia, his projects included the Bukit Belimbing residential project and the Sierramas. In Australia, he managed and developed portions of the Como Hotel shopping and residential project in Melbourne. 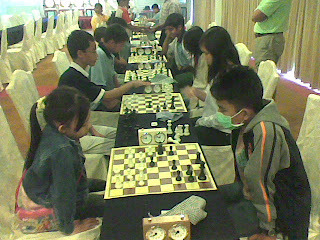 “The Dato’ Arthur Tan Chess Centre was set up near the beginning of the year. I realised that the Malaysian chess public would need a practical centre to take part in activities and raise the level of the game. It’s something that my son himself would have liked to do. What would Tan consider as his biggest achievements on the world stage? “I value greatly the award of Commander of the Legion of Grandmasters given to me by Kirsan Ilyumzhinov, the president of the World Chess Federation, when Fide celebrated its 75th anniversary in 1999. Only 20 people worldwide were recognised. And a few years earlier, I was given direct membership in Fide. Very few people are direct members of Fide, all others are national chess federations. “I was also a deputy president of Fide for four years from 1982 and was part of its executive board until 1990. In 1990 and 1994, the leading members of the exco – the main representatives from Asia, Europe, the Middle East and South America – offered me, in effect, the Fide presidency. But I declined to run both times. I couldn’t be visiting a hundred or more countries. The time wasn’t right. There were other priorities in my business back here. “Rapid chess was proposed by me, so that more people can take part in short tournaments and events. It took years for rapid chess to be accepted. If I remember, countries in the West, like Bulgaria, objected to it but after several years, the Fide family has come around to support it. Today, rapid chess is used not only for weekend events but also as a tie-break system at high-level matches. “So you see, all these efforts have been good public relations for Malaysia,” said Tan. Need a Grandmaster to teach our young chess players. Promised and committed to support and sponsor Arthur Tan Malaysia Open for five more years. Donated and sponsored the DAT Chess Center located at the fourth floor, Wilayah Complex. Willing to donate one-third for chess development fund and expects the government and big corporations to provide the other two-thirds. Datuk Tan was awarded the Commander of the Legion of Grandmasters and and direct membership by FIDE (only few recipients). Datuk Tan was elected as FIDE Deputy President from 1982 until 1986. 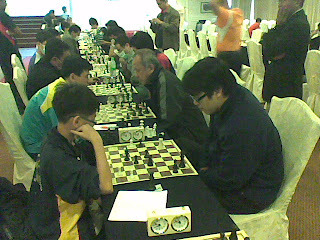 Rapid chess was Datuk Tan's brainchild. 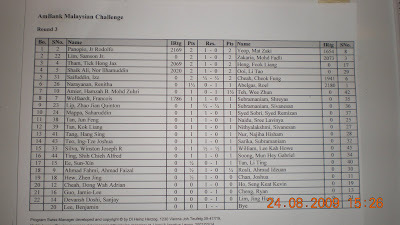 GiLoCatur received a SMS from Mr Azhar MS regarding several chess tournaments under his belt. So those three dates - 25 Oct, 7 Nov & 14 Nov, are open as for now for other chess organizers to conduct a chess tournament. On behalf of En Azhar, a very deep apology to all chess players and enthusiasts for any incovenience caused. Bersempena ketibaan 1 Ramadhan esok SABTU 22 Ogos 2009, GiLoCatur ingin mengucapkan SELAMAT BERPUASA kepada semua umat Islam amnya di seluruh dunia, khususnya kepada semua muslimin dan muslimat di negara Malaysia tercinta ini. 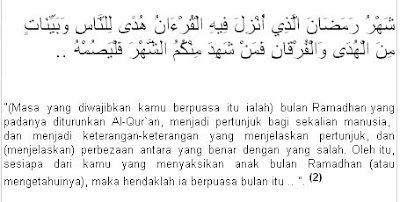 Semoga kita semua dirahmati dan diberkati oleh ALLAH swt. Kepada yang participate dengan aktiviti catur di bulan kemerdekaan ini, GiLoCatur ingin berpesan agar amal ibadah puasa dan ibadah-ibadah wajib lain dilakukan dengan sebaik mungkin. Semoga Ramadhan akan sentiasa memberi keinsafan di atas kekerdilan dan kelemahan kita di sisi ALLAH azza wajalla. Sila ke link berikut di portal JAKIM untuk mengetahui takrif puasa dan kelebihan-kelebihannya. GiLoCatur amat tertarik apabila membaca "post entry" Minda Catura di laman blog SelChess seperti di bawah. Beliau telah memberi sedikit ulasan, komentar dan pandangan berkenaan sukan catur di negara ini. Selamat menyambut bulan kemerdekaan MC ucapkan kepada semua peminat dan penggemar sukan catur di Malaysia. Semoga sambutan kemerdekaan pada tahun ini akan membawa seribu keinsafan buat kita semua, apatah lagi sambutan pada tahun ini adalah dalam bulan Ramadhan yang mulia. Mudah-mudahan keinsafan dan ketaqwaan akan bersama kita dalam mengharungi saki baki usia tahun 2009. Bercakap tentang kemerdekaan ini mengingatkan MC tentang sukan catur di negara kita. Ada sesetengah pendapat mengatakan sukan catur ini belum sepenuhnya merdeka di negara kita. Pelbagai ulasan dan komentar yang MC dengar dalam hujah mereka untuk menegakkan dakwaan tersebut. Pelbagai matra dan dimensi disentuh, antaranya pengurusan, perancangan, penglibatan, komitmen, dan bermacam-macam lagi. (Sukan catur belum sepenuhnya merdeka! Benarkah? Ini pada pandangan GiLoCatur merupakan satu perkara pokok yang perlukan perbincangan dan kajian yang mendalam. Jika catur ingin menjadi salah satu sukan yang cemerlang, gemilang dan terbilang di negara ini, pelbagai usaha perlu dilakukan dan dilaksanakan. Usaha ini amat perlu dilakukan jika sukan catur ingin bersama-sama sukan lain seiring menyahut seruan KISMAS 2009 yang telah berlansung baru-baru ini dalam bulan kemerdekaan. Apakah KISMAS? Adakah penggiat-penggiat sukan catur terutamanya orang-orang penting persatuan-persatuan dan kelab-kelab catur menyertainya? Jika tidak adalah amat malang sekali kerana sudah tentu pelbagai maklumat dan info penting tentang halatuju industri sukan di negara ini tidak dapat digapai dan diketahui. Ini bermakna kita akan ketinggalan dalam perancangan untuk pembangunan dan kemajuan sukan catur. Ini bermakna kita tidak peka dengan info dan maklumat penting yang boleh membantu meningkatkan industri sukan catur di negara ini. Jangan di kemudian hari kita menyalahkan orang lain apabila sukan catur masih ketinggalan jauh di belakang sedangkan sukan-sukan lain jauh maju kehadapan. Objektif utama penganjuran konvensyen ini ialah untuk menjana pembangunan sukan sebagai suatu industri di Malaysia dengan lebih professional, teratur, berkualiti, kompeten dan menguntungkan bagi semua pihak yang terlibat baik secara langsung mahupun tidak langsung. Selain itu, ia juga diharap dapat menggalakkan rakyat terlibat secara aktif di dalam sukan dan rekreasi agar faedahnya dapat dirasai seluruh Negara sekaligus membentuk “1 BELIA 1 MALAYSIA”. Persatuan di peringkat pusat bagi MC perlulah menjadi pendorong ikhlas untuk mempercambahkan lagi kewujudan persatuan-persatuan catur di peringkat negeri dan daerah. Sesuatu perlu difikirkan hari ini demi memastikan kesinambungan sukan ini bukan sahaja tidak mati, malahan akan menjadi lebih baik dan bertambah baik pada masa-masa yang akan datang. (GiLoCatur amat bersetuju dengan pandangan ini. Kelab-kelab catur di peringkat akar umbi perlu diperbanyakkan terutamanya di peringkat komuniti, taman-taman perumahan dan kejiranan, di samping sekolah-sekolah. Amatlah wajar dan penting persatuan catur di peringkat pusat menjalinkan hubungan dua hala dengan Kementerian Pelajaran Malaysia, dan Jabatan-jabatan pendidikan negeri dan daerah bagi merancang dan memajukan catur di peringkat sekolah-sekolah. Kita perlu membantu penggiat-penggiat catur di kalangan guru-guru yang selama ini telah berjasa dan berusaha memaju dan mengaharumkan sukan catur di persada negara seperti Cikgu Rahman (ayah IM Mas Hafizulhelmi), Cikgu Bakri (ayah FM Anas dan NWM Alia Aznin), Cikgu Ahmad Fuad (ayah Fairuz Hamizah & Sirajuddin), Cikgu Zaza (ibu Nabil, WCM Nabila & WFM Najiha), Cikgu Sabirin (ayah Aisyah dan Khadijah) dan ramai lagi yang lain [.. hanya sekadar menyebut beberapa nama ..]. Kepimpinan hari ini perlulah (1) memikirkan dan melihat sukan ini 10 tahun, 20 tahun, atau lebih daripada itu dalam merangka strategi untuk memartabatkan sukan ini, khususnya menaikkan nama negara ke persada dunia. Janganlah tumpuan dinihari sahaja yang cuba dicapai sedangkan kecemerlangan secara tekal dan tuntas di masa hadapan tidak pula tergapai. Anak-anak muda kita semakin hari semakin bertambah dan bercambah menceburi sukan ini dan hari ini hampir kesemua sekolah dan pusat pengajian tinggi sudah membentuk persatuan catur mereka, justeru kita seharusnya memperbanyakkan kegiatan bercatur ini di peringkat komuniti pula kerana untuk menarik minat generasi muda mencintai sukan ini secara bersungguh, maka (2) ibu bapa mereka terlebih dahulu dimesrakan dengan sukan ini. Bukankah kata pepatah, tidak kenal maka tidak cinta. (GiLoCatur amat-amat bersetuju dengan dua point dalam perenggan di atas. Pertama, Pelan perancangan dan pembangunan untuk jangkamasa panjang (long-term planning and development blueprint) perlu dirangka dan dikaji. Seterusnya perlu dilaksana. Kedua, para ibubapa perlu diperkenal dan digalakkan agar meminati sukan catur bagi mendorong anak-anak mereka pula bergiat dan berkecimpung sama. Sudah ramai para ibubapa yang GiLoCatur temui tidak ada maklumat dan info asas dan penting tentang catur. Di mana mereka hendak merujuk dan bertanya? Dan ramai juga di kalangan para pelajar yang berminat dan berbakat tetapi tidak mendapat sokongan daripada ibubapa mereka. Sebenarnya perjalanan sukan catur di negara ini masih jauh. Banyak yang masih boleh diperbaiki dan dimajukan. Tetapi "spark" dan apinya sudah bermula dan semakin hebat. Apa indikatornya? Semakin banyak pertandingan catur yang telah dan akan diadakan sehingga ada ketikanya bertimpa-timpa pada satu masa dan boleh dikatakan setiap minggu. Ramai pemain-pemain catur yang sudah lama tidak aktif kembali aktif. Semakin banyak laman-laman blog tentang catur di negara ini. Kelab-kelab catur yang semakin banyak dan aktif dan juga permintaan jurulatih dan program-program catur semakin tinggi dan banyak. Justeru itu, GiLoCatur berseru kepada semua penggiat dan peminat-peminat catur di seluruh negara terutamanya orang-orang penting dalam persatuan catur menggembeling tenaga dalam memajukan industri sukan catur seiring dengan KISMAS 2009. 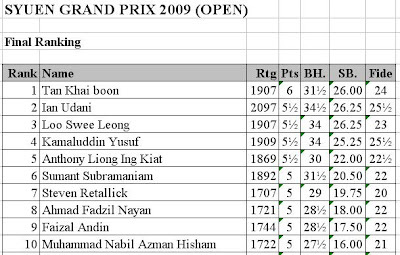 Kepada pemain-pemain muda catur negara, rebutlah peluang yang ada sekarang seperti peluang menyertai Malaysian Masters 2009 dan pelbagai pertandingan catur untuk meningkatkan kualiti permainan dan tanamkanlah cita-cita mendapat gelaran tertinggi dan sentiasa memperbaiki rating. Jangan sekadar terlibat hanya untuk suka-suka dan mendapat sijil untuk sokongan akademik. Sukan ini juga mampu bertindak sebagai medium bagi menyatupadukan segenap lapisan masyarakat yang terdiri daripada pelbagai latar belakangnya. Jika ini berjaya dilaksanakan, betapa beruntungnya semua penggemar sukan ini dan tidak ada lagi prasangka negatif lagi pesimis sesama kita...........Siapa pun kita,,kita anak Malaysia....Jika ini dipegang, barulah kita benar-benar merdeka. Berikut adalah petikan berita tentang catur di Kedah yang ditulis oleh Cikgu Ahmad Fuad, seorang guru dan juga penggiat catur terutamanya di sebelah utara. Selain dari anak-anak beliau - Fairuz Hamizah dan Sirajuddin, yang juga merupakan pemain-pemain catur junior yang hebat di negara ini dan boleh diketengahkan ke peringkat yang lebih tinggi, Cikgu Fuad juga membimbing dan mendidik anak-anak murid beliau cemerlang dalam catur. GiLoCatur juga ada bertemu beliau sewaktu ASAT 2009 di Kuala Lumpur di mana beliau merupakan guru pengiring bagi pemain-pemain catur Negeri Kedah. Di bawah pengawasan dan bimbingan beliau, pemain-pemain catur Negeri Kedah telah mendapat kejayaan cemerlang. Diharap Cikgu Ahmad Fuad akan terus memberi sumbangan dan bakti terhadap kemajuan catur di negara ini. Tempat: Pejabat FAMA, Jalan Yan, Guar Cempedak, Kedah. Mereka ialah Muhammad Darwis b Mohd Sabri, Meor Abdul Aziz b Ishak, Mohd Al-Hakimi b Adnan dan Muhd Hafiz b Zaabar. Pemilihan mereka adalah berdasarkan pencapaian dalam Pertandingan Catur Tertutup SMKTJ 2009 yang adakan pada 1 Ogos, 2009 di Kantin Sekolah dengan disertai oleh 56 orang peserta. GiLoCatur menyertai pertandingan catur Syuen Grand Prix pada hari Ahad lepas di samping ketiga-tiga anak GiLoCatur. Fikri sertai Bawah 15 tahun sementara Anis dan Fahim sertai Bawah 12 tahun. GiLoCatur bertanding dalam kategori terbuka. Walaupun prestasti permainan GiLoCatur tidak berapa bagus dalam beberapa pertandingan yang disertai sejak kebelakangan ini seperti Laguna Park, Dun Sri Andalas, dan Terbuka Temerloh, tetapi pada dasarnya masih berpuas hati kerana jarang berlaku "silly / big blunder". Kebanyakan game GiLoCatur, middle game dan endgame yang masih kurang menyengat. Kekadang dek asyik nak attack, akhirnya terperangkap dan tewas. Pada awalnya GiLoCatur tidak mahu sertai pertandingan kerana pelbagai alasan tetapi keinginan untuk bermain catur mengatasi segalanya. Selalunya GiLoCatur lewat berada di meja kerana perlu memantau permainan dan persiapan anak-anak. Berikut adalah beberapa situasi permainan GiLoCatur di Kejohanan Syuen Grand Prix. Game di atas adalah di pusingan ke 5 ketika GiLoCatur menentang Ahmad Kamal Rustam Affendi yang memiliki Nat. rating 1642. GiLoCatur tewas masa dan posisi buah juga tidaklah memberansangkan. Tetapi tidak juga teruk sangat pada pandangan GiLoCatur. GiLoCatur kurang 2 bidak. Struktur bidak GiLoCatur juga isolated dan tidak berapa bagus. Walaupun GiLoCatur ada kelebihan satu rook, tetapi lawan memiliki tempo dan posisi yang lebih baik. GiLoCatur tidak dapat bertahan dengan baik menyebabkan pihak lawan ada advantage. GiLoCatur tidak memanafaatkan advantage memiliki extra 1 rook yang menyebabkan tewas dengan sedikit time pressure. But GiLoCatur believes it was a very decent game againts a much higher rated player. GiLoCatur was also quick during the opening. Game di atas adalah di pusingan ketujuh ketika menentang Zairulnizam Abd Rahman (Nat. rating 1477) . GiLoCatur juga ada extra 1 rook tetapi sayang telah tersilap move (blunder) dengan membenarkan pihak lawan membuat fork menggunakan kuda (Ne7+). Di atas kesilapan tersebut, GiLoCatur terus resign. Sepatutnya GiLoCatur gerak Rf7 untuk defend bidak f7 atau Na5 untuk ancam Queen putih. Mr Fritz pula mencadangkan Qf7 atau Qd7. 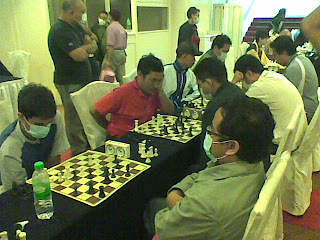 Some players wear mask like the Azman's family and some did not during the tournament. 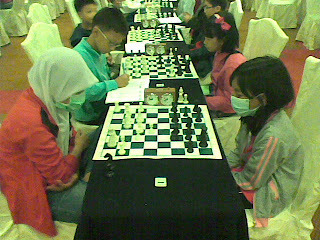 In Open category, there were few young players participated like the above teenager (left) and WCM Nur Nabila. Some Open section players in action. Mr Subramaniam, the father of Sumant, Sarika and Shreyes, was also taking part. 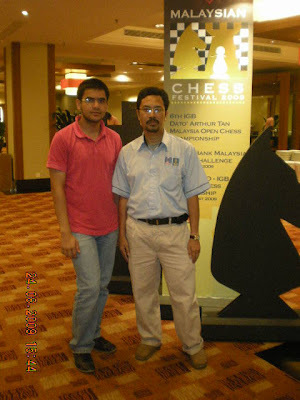 They are one of the active chess families in Malaysia. Battle of the top seeds in Under 15 section between Sarika Subramaniam and Fikri Saleh. Before the game, GiLoCatur believed whoever win will be the champion. Truely enough, Sarika won the game and eventually was the champion. 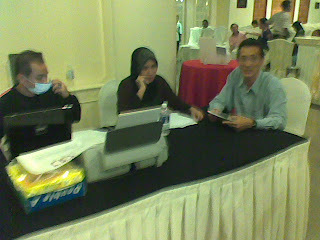 The committed and dedicated organizing team Mr Raymond Siew (far right) and Encik Kamaruddin. Sorry, GiLocatur does not recognize the lady sitting in the middle between the gentlemen. 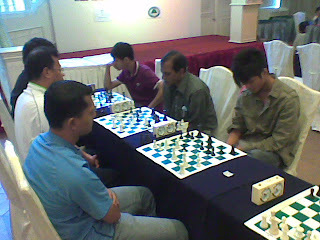 Kamaluddin Yusof (right) on the second board played black. 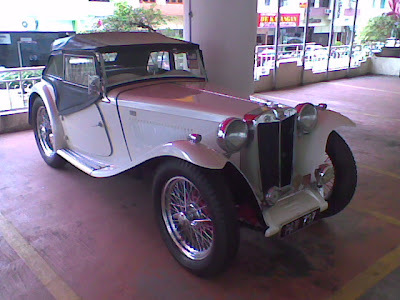 Whose classic and antic car as per the above photo belongs to? It belongs to the owner of the Syuen Hotel, one of the two main sponsors. The sponsors and the organizers. 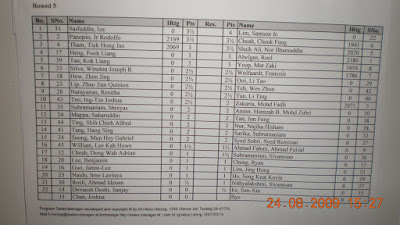 Below are the results of the Syuen Grand Prix chess tournament held yesterday in Ipoh. There were three categories which attracted about 110 players. 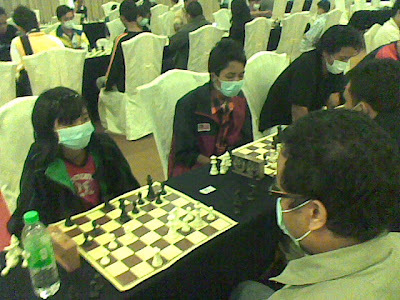 Eventhough, H1N1 is spreading and its victims increase day by day, committed chess players and lovers still come to participate. They were supplied the masks by the organizer. As the common chess tournaments in the country, there are seven rounds. Basically, it was rapid with 20 and 25 minute time-control. The tournament started at around 10.00am. Four rounds were played before lunch while the other three after lunch break. Again, Ian Udani was stopped by the local player to win the RM1,000 reward. This time by Tan Khai Boon. Ian had to settle as the first runner up. 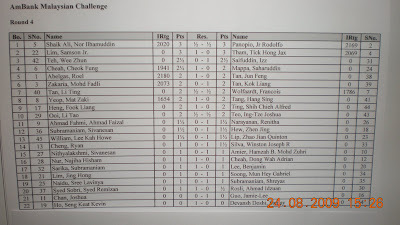 Eventhough, Khai Boon lose to Ian in the fourth round but Ian drew with Kamaluddin and lose to Anthony in the last round. 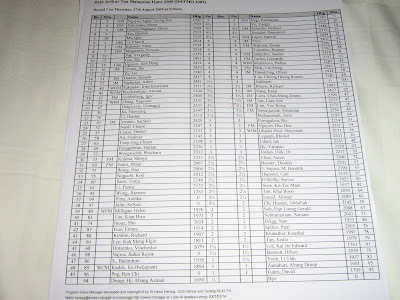 Khai Boon won by half point when he only lose to Ian but won the rest. Ian and three other players had same 5 1/2 points but he had better tie breaks. 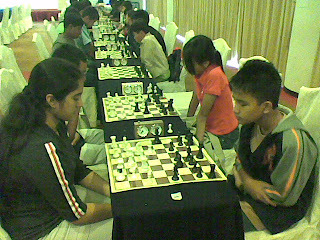 Two teenage players - Sumant and Nabil managed to win the sixth and tenth place respectively. While both Faizal Andin and Fadzil Nayan along with an expatriot, Steven Retallick, had filled up the other three top 10 spots. 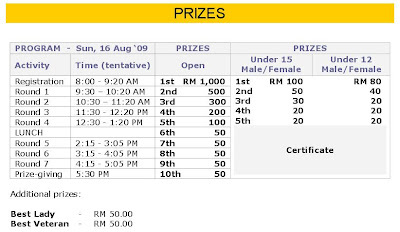 Only Top 5 in U12 section won the prizes ranging from RM 80 (the champion) to RM 20 (the fifth place). Other top young players make up the sixth to tenth place - sixth (Shreyes), 7th (Teh De Zen, the top seed), 8th (Anis Fariha), 9th (Chuah Hao Feng) and 10th (Wong Yi Chee). Two other Selangor U12 girl players - Nabila and Chew Eewen, played in the Open and U15 sections respectively. Congratulation! to the organizers and the sponsors and all parties who made the tournament successful. Your great efforts must be appreciated and very important in boosting up the chess scene in the country. GiLoCatur and all chess players surely need the strong and continuos support and commitment from the organizers, sponsors and arbiters. 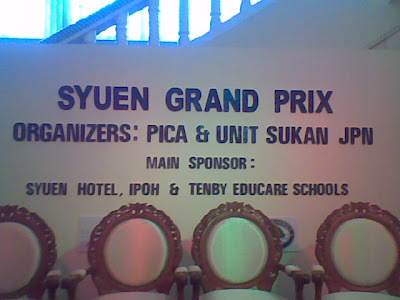 Hopefully, more and more chess tournaments like Syuen Grand Prix will be held in the future with more sponsors and rewards especially for the Under 15 and Under 12 sections. These young chess players are our future hope that need to be developed so that the dream of Malaysia having its own GrandMasters will be achieved. 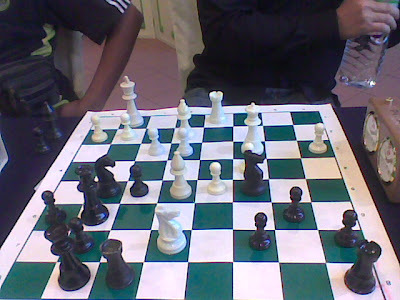 Below is the game between FM Nicholas Chan and NM Evan Timothy Capel held at DAT Chess Center this morning. 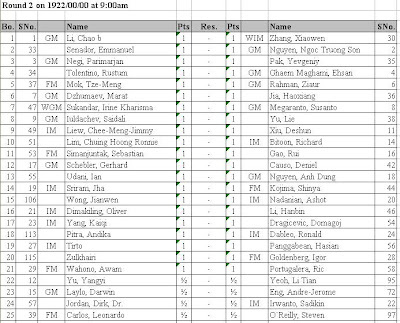 Can NM Evan upset the Malaysian Top Active chess players, FM Nicholas? Let's follow the event held during this weekend and covered by Andrew Ooi aka Gilachess, Hairulov and experienced IM Jimmy Liew in their chess blogs. move 36.Rb7 is another interesting move. He had anticipated black move on 36. .. Rxa2 so came the exchange play after he gained a major piece i.e. a bishop and a pawn. This sort of anticipation and advance thinking and strategy that the young Malaysian chess players should learn from the senior and experienced Malaysian chess players. move 40.Rf6+ is another brilliant strategy in GiLoCatur's opinion. If the black king captures the rook, White still can get even by 'forking' the black's rook (GiLoCatur hopes the term is correct he he). But if otherwise, White can capture the f5 pawn. move 50.Rf6+ another one? amazing .. Black really did not see and anticipate on its 48. .. Rc3 move. To be among the top players, > 2350+, our young chess players should work and improve on this sort of advance or ahead counterplay. (GiLoCatur is not sure why NM Evan made such move, maybe he was on time pressure.) This time Black did not capture the rook. But it was already too late. MOH KITE KE IPOH YEOP DAN YONG SEMUA! 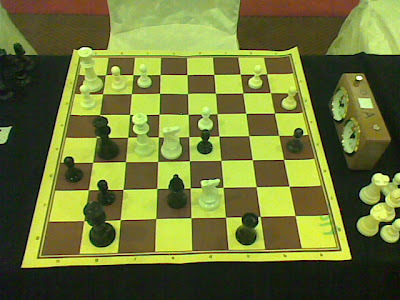 ADA SATU PERTANDINGAN CATUR BERTARAF KEBANGSAAN (National-rated) ANJURAN PICA (Persatuan Catur Negeri Perak) dan Hotel Syuen. Sila ke sini untuk download registration form.